To the land of classic fairy tales. Recalling The Emperor's New Clothes and our expectations for a transparent genuine and decisive gathering (of men). The Copenhagen Summit, Denmark, is a UN meeting, Dec 7 - 18 aimed at coordinating action against climate change. In a wildnerness area but never far from a jet route overhead. These birds were asking- even demanding- some share of our picnic lunches! 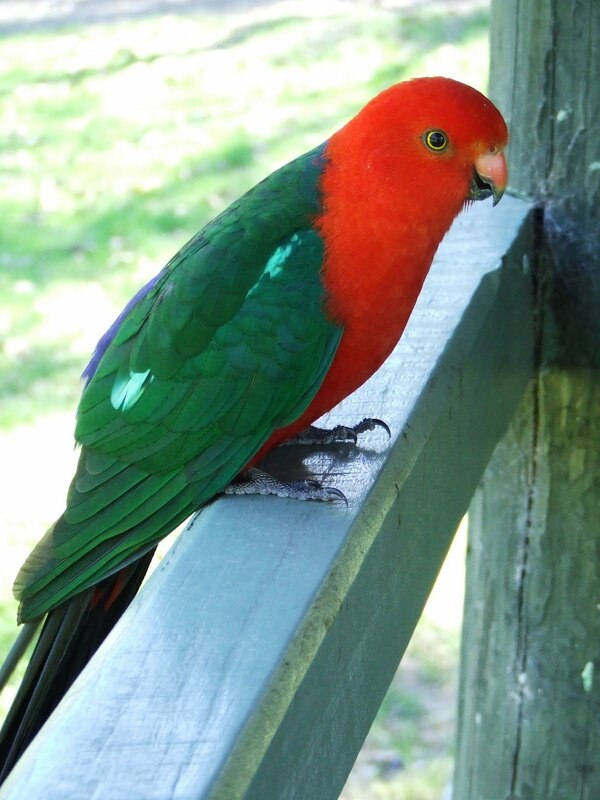 Australian King Parrot, scarlet head and dark green, male, found on the eastern coastal strip. 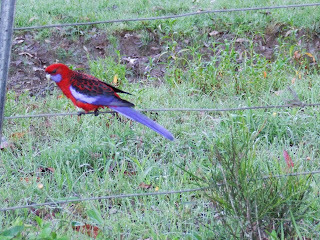 Crimson Rosella, the bird on the wire. 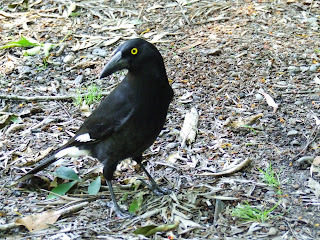 Pied Currawong, Black. Widespread on the East Coast areas. 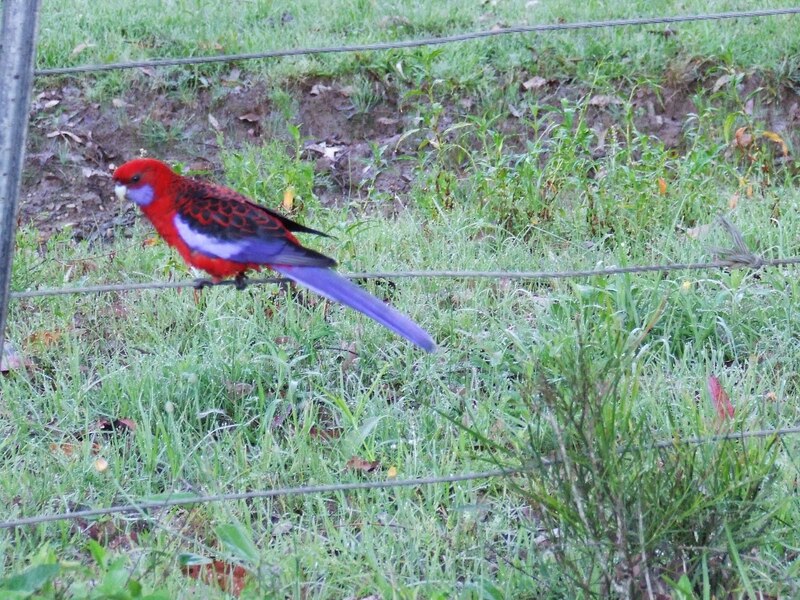 As elsewhere, some bird species are very scarce and endangered or are gone forever. Countdown to Copenhagen Summit: 8 days. Telegherry River, Chichester State Forest, noisy rapids, shallow streams, small, deeper swimming holes and chilly refreshing waters, most inviting at high noon. Anyone for a skinny-dip? 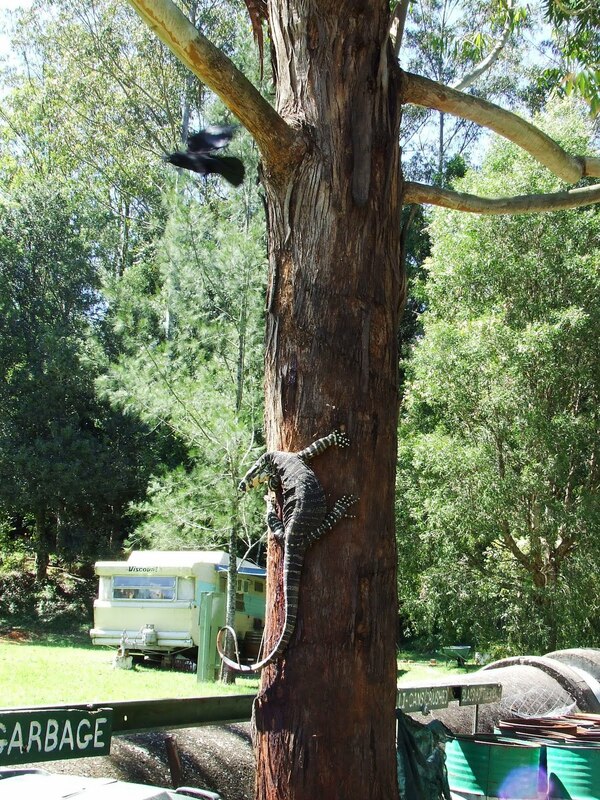 Goanna Monitor Lizard. The lizard was busy scavenging and came under attack by two birds who swooped down close and made lots of noise. 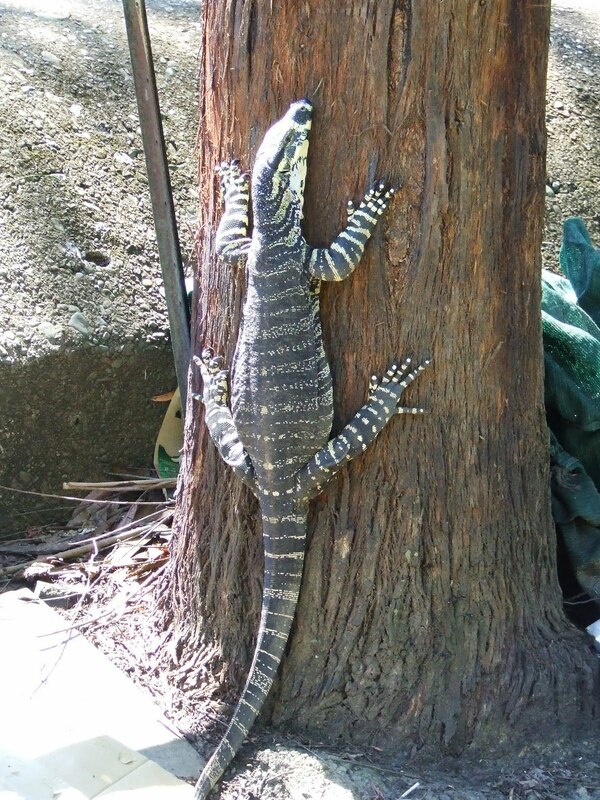 Lizard climbed the tree and became even more exposed. Countdown to the Copenhagen Summit: 10 days. Our policy on climate change has big concessions made in response to the opposition party even when the opposition is just fooling around. They are deflecting attention onto their issues when the attention is not deserved although their rants echo the doubts and the questions that arise. Parliamentarian's ego is not a priority but media has made their goings-on sacrosanct. I want 'the real'. I want effective climate change policy even if it costs us, not just a policy made to make a political party look good and seem forward thinking . Scenes from nature fill us with thanksgiving. 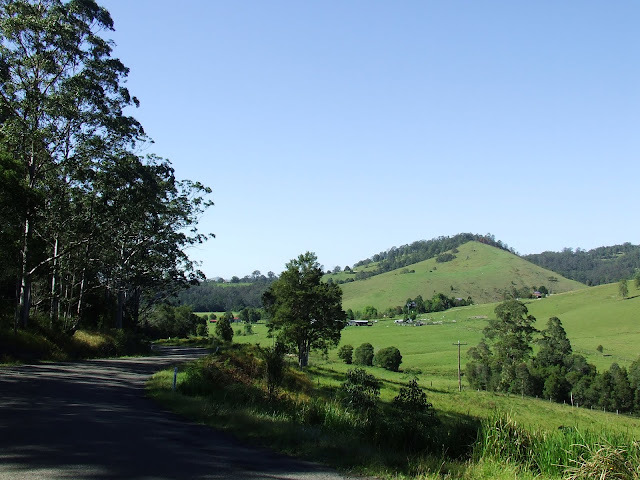 Beyond Dungog and north-west of Newcastle. 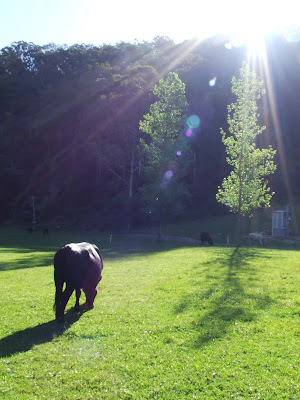 Cattle were grazing in Ferndale Park. Parrot was another visitor. Beam me up! The Hadron or Haldron Collider, in background, emerged there all the way from Switzerland ! 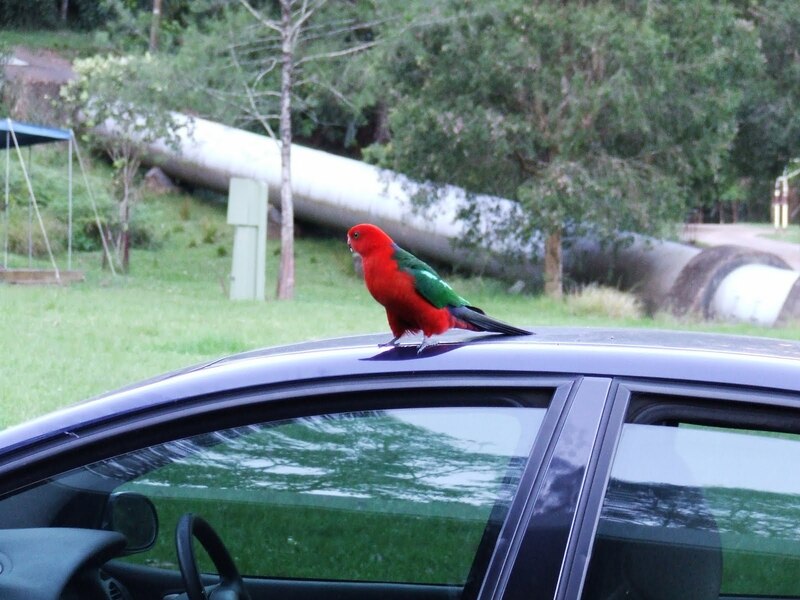 Travellers behaving badly. Booked for a flight to Asia, we got as far as Brisbane and were disappointed that we had to totally disembark and change planes with a two hour interval. It was about 10pm and a toddler was in the group and we put her in a wheelchair while we negotiated the procedures such as arrangements about the duty free we had foolishly got in Sydney. The wheelchair was quite a hit, in fact, seem to lead to priority with reboarding, which was unintended, yet gave us a chuckle. Another time, a wheelchair came in very handy to cart my gear around when there were no trolleys at all, and nothing but perfumes, chocolates and liquor to look at during a three hour wait for another flight. (In each case other wheelchairs were available for others to use). 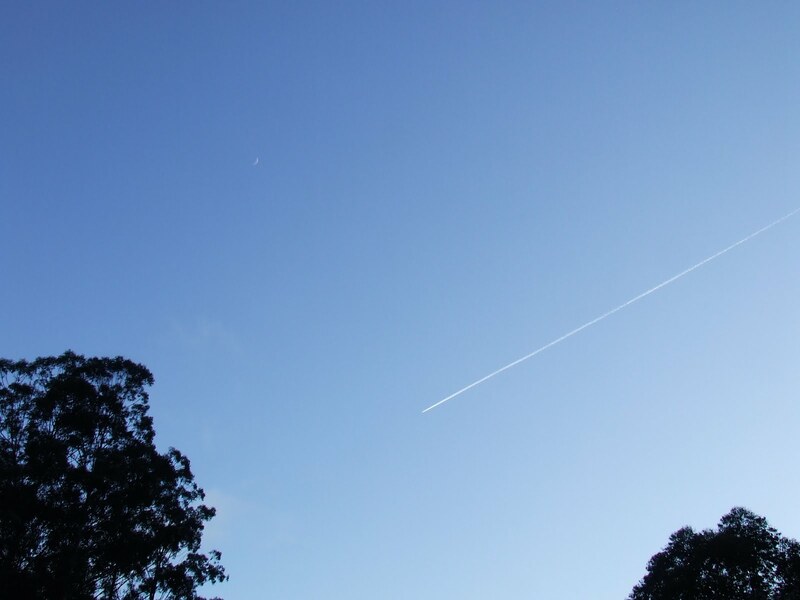 But all that was before the days of climate change when travel was carefree. 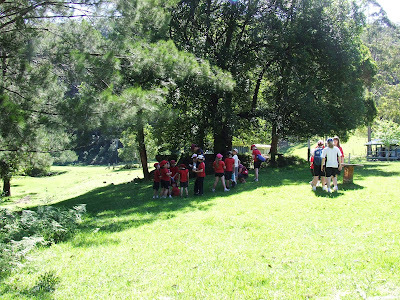 School children from Newcastle after a walk to see the dam and the river. An adult was overheard. "Children: stop having so much fun ! " Up-market resorts and a range of places are available there but a real classic sixties caravan park is found at Ferndale Park with vernacular buildings that grew like Topsey and grassy slopes beside a tree lined babbling brook all hemmed in by trees and more trees. 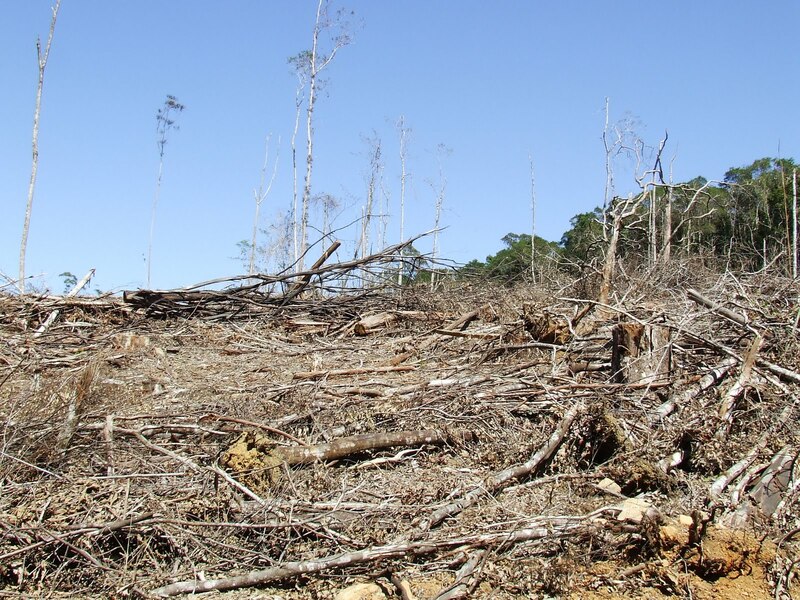 Yet there's progress in the form of a new composting waterless toilet in the middle of a clearing! 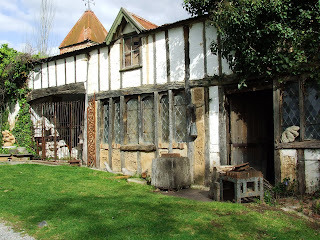 A cottage is a more recent addition seen here on the web site. Is this our most precious resource? 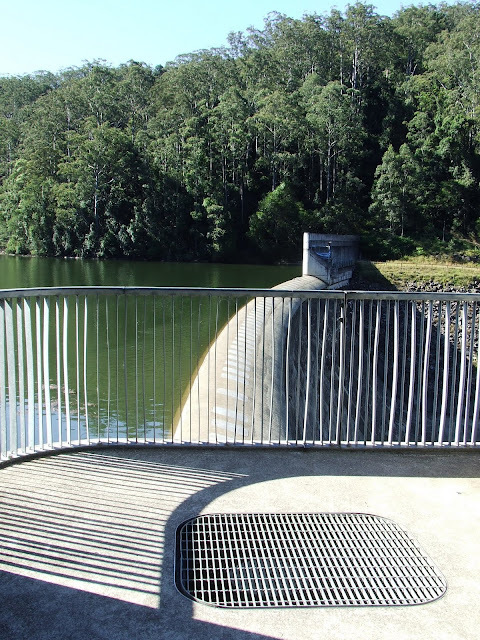 The dam supplies water to the Newcastle region. Where would we be without it these past few days of heatwave conditions? The dam is in a wilderness area to the north of Newcastle; we are not talking about alps here. The mountains and the plateau are shared out between the water catchment of Hunter District Water; state forests, reserves and conservation areas; Mount Royal National Park and Barrington Tops National Park reaching about 1500 metres above sea level. Barrington Tops covers over 74 000 hectares listed as a World Heritage Area protecting much of it as Wilderness. It was born from an ancient volcano and forms part of the Great Escarpment. 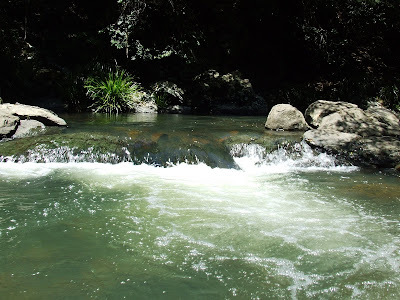 The rugged landscape... forests and streams... provides habitat for a wide range of plants and animals. In this area many northern and southern plant species meet the limit of their range...protects more than 50 rare or threatened plants and animals..... NSW National Parks and Wildlife Service. Chichester State Forest exists for timber production as well as conservation and recreation. As far as I know, trees are planted, grown and cut down again. 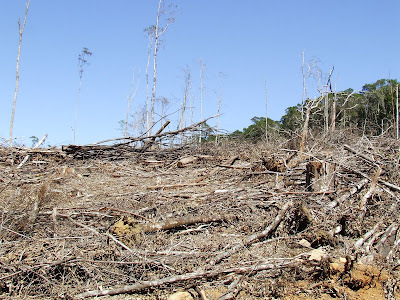 Selective logging might also be carried out. 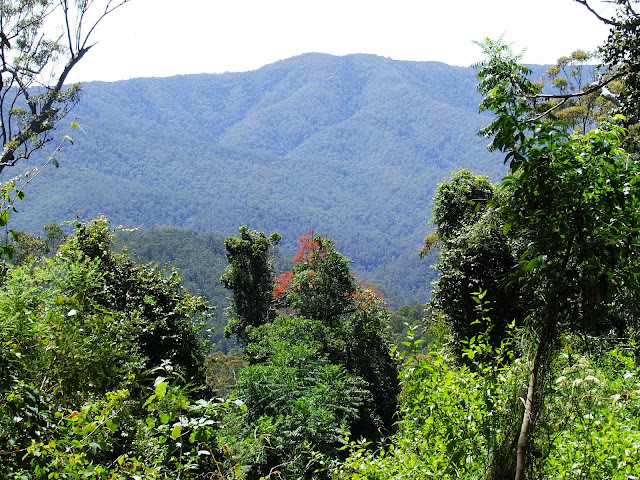 Stands of sub-tropical rainforest, thick with vines and tall timbers, are found on the steep sides of the valleys where they slope down to the streams and these stands are often left to grow undisturbed. Any opening up of the canopy or round the edge of the rainforest has its consequences. Wangat Road begins a round trip which from Dungog and back covers about 90km of cool hilly remote country with a fair share of dust but easy enough for a 2WD in dry weather. 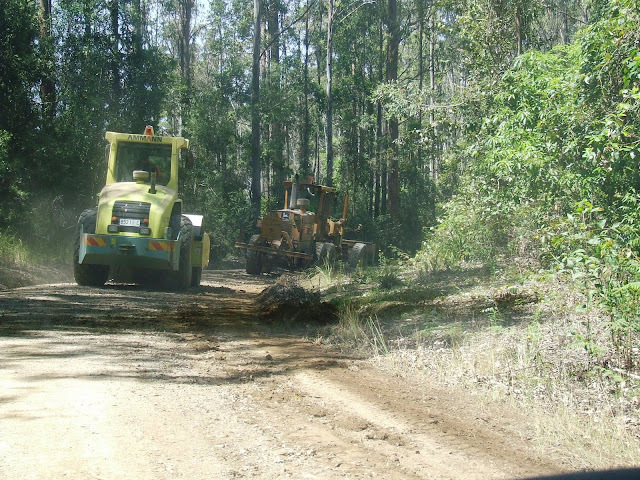 A few logging trucks also use the roads and trail bikes could well be there somewhere.. The interior of Sydney Opera House is of laminated Brush Box timber from the Dungog forests. Chichester State Forest to the north of Newcastle. 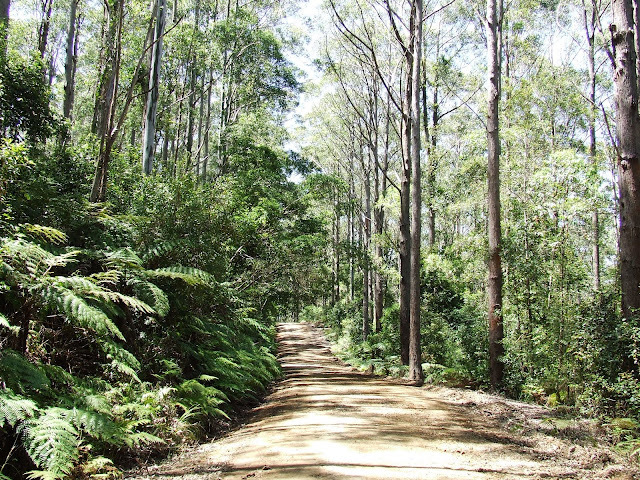 A dirt road takes an easy climb through the tall timbers and constantly winds round gullies full of dense rainforst and eventually a few breaks allow the day tripper to see out further afield. At about 900 metres or 3000 feet Antarctic Beech trees begin to grow and eventually they dominate the higher cool temperate areas (not accessed by this particular road). A signpost or two could have allowed for identification of the species. Twilight fever is upon us. 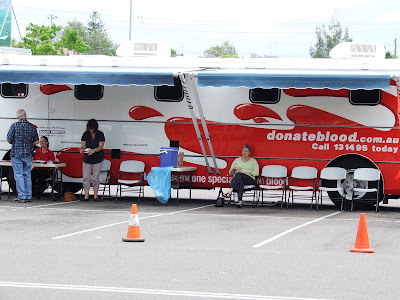 The mobile blood bank appears on the scene to seek out generous blood donors. Shoppers and a generous pre-Christmas spirit were exploited here. 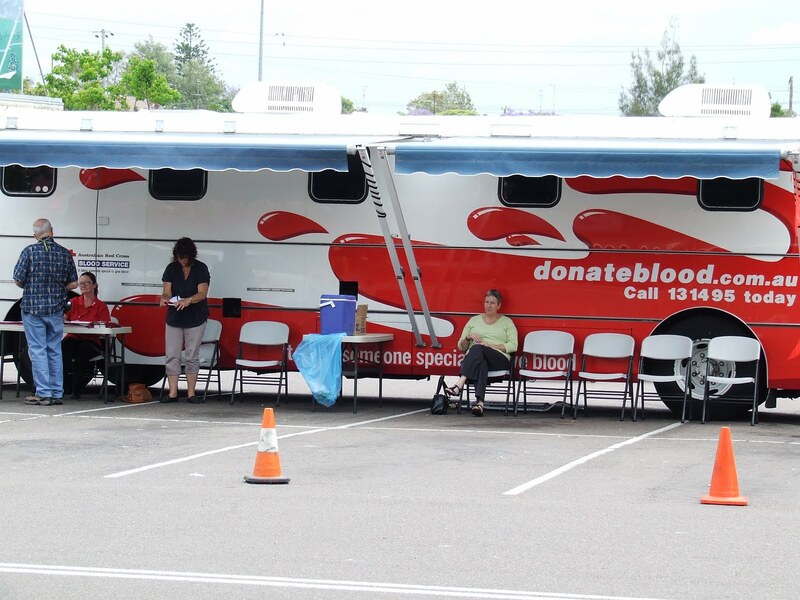 The blood-mobile could well have camped outside the cinema for the midnight sessions of the Twilight sequel. The total blood volume of the standardized 70 kg male is about 5.6 litres. Blood group A is most common; group B is further down the list; AB is much less common and group O must be rare. Donors are screened for various reasons, for example, former residency in England for some months in certain years is a problem due to a disease outbreak there. A new situation means that the New Moon sweethearts are parted and Bella will stay behind to subside into a chronic sulk....and use ...her pronounced gift for slouching and mumbling. Sadly the director hasn't a clue and can make two hours and ten minutes seem like a thousand years were great lines from the reviewer Sandra Hall in The Herald, 18 Nov, 2009. Truly a must see film. A minor building in an appealing hamlet, with features of, say, certain timber-framed cottages from England with close spaced timber studs, plaster panels, diamond lattice windows, half timbers and dormer windows. 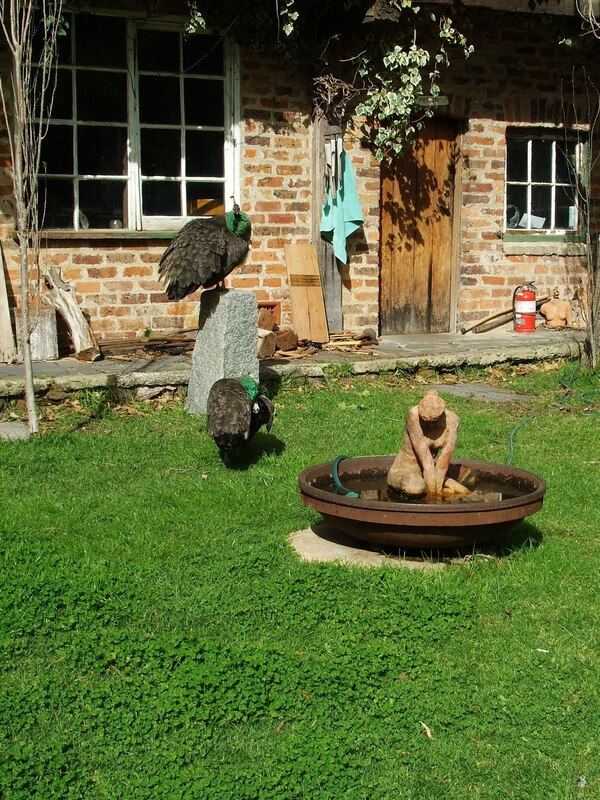 Here accommodation is available for artisans. 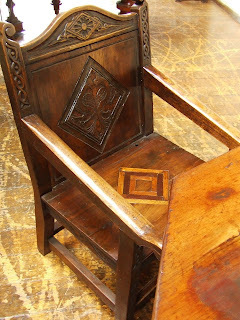 Is this example akin to a poor artist's garret? More trivia. A scholar, Betty Roland lived in this colony in the 1960s. As a writer she was into plays, comic strips and journalism and was a follower of the left wing. She had worked in London and had been in Moscow in the thirties with a Marxist associate, Guido Baracchi. "He reminds us of what we have lost and of what we might gain by learning to love the quest for justice once more." 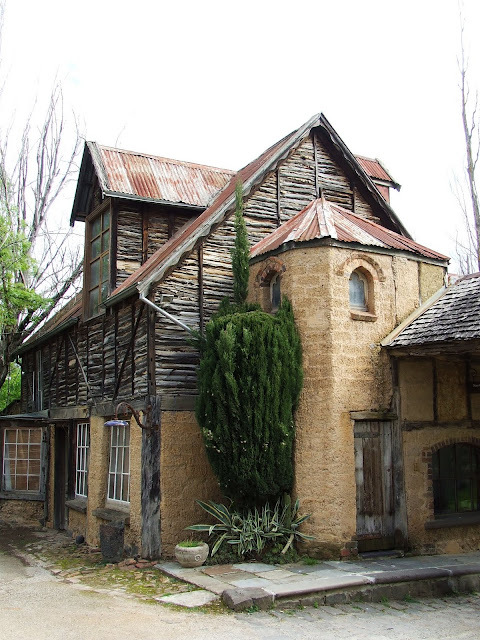 Another group of buildings are rustic in mudbrick and pise. More trivia. Max Teichmann was an acquaintance of Lily Jorgenson and he married her niece. Teichmann introduced Jenny to philosophy which she made her career. Her writings are listed on the web. 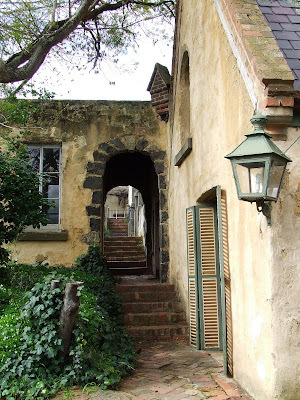 They built their mud brick house outside the gate of Montsalvat. He was up in arms about unbridled capitalism and there is more about him here. The Long Gallery and aMuse nearby. X. continued: Goth and Montsalvat. 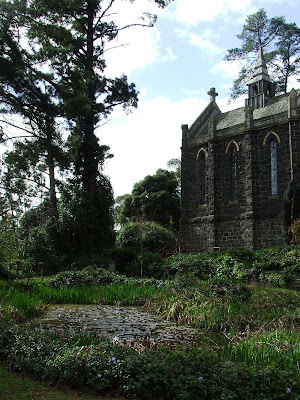 Rising above a lily pond and garden is a small chapel, like a detailed model. On its walls, paintings of the crucifixion seemed excessive in number and perhaps there was a reason. One of Jorgensen's last paintings was a crucifixion with Jorgensen himself on the cross. The feudal master, Jorgensen, founder of Montsalvat, died in 1975. 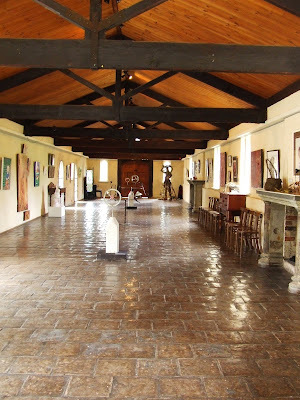 In accordance with the provisions of his will Monsalvat was administered by a trust and continued as an artists' colony and function centre. 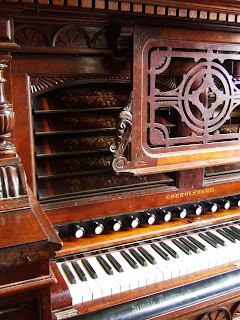 Lower photos: The harmonium was a large example. 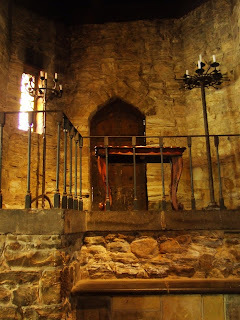 A side chapel is shown. 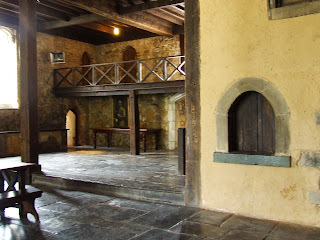 IX continued: Great Hall at Montsalvat. 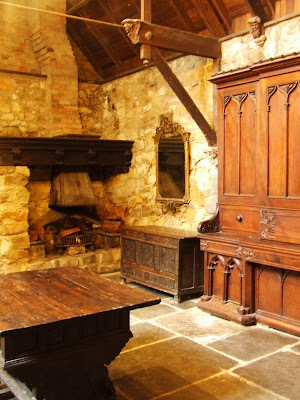 We don't have any old castles or chateaux or anything built prior to 1770 so this reproduction is an unusual site for us to see. A theme park? 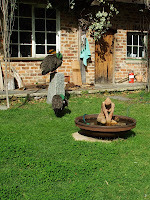 From ancient times, prior to the Europeans, the Aborigines left few marks on the landscape and did not use long-lasting buildings, (although, possibly, a patch of stone ground-works were found but the details elude me). 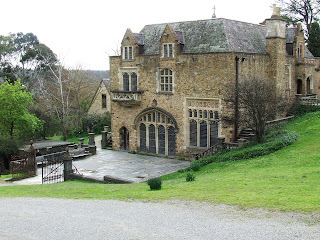 VIII continued: the master, the artists, the muses and Montsalvat. 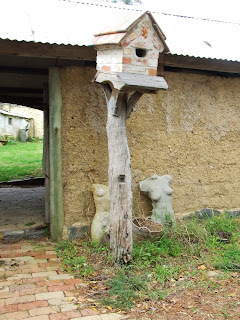 Sonia Skipper, artist and builder, was declared a 'National Living Treasure' by the South Australian State Government. 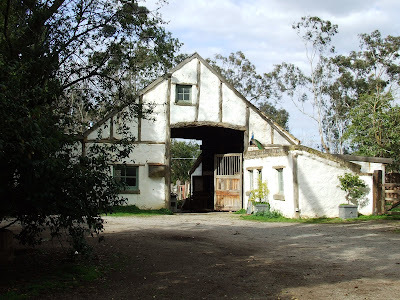 She had moved to Renmark in later years with her life partner. She died in 2008. 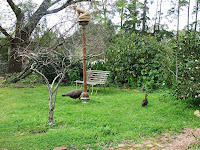 A memorial service and later a retrospective were held at Montsalvat. As young women pioneers of the artists' colony, Sonia and her sister, Helen, found that their grandmother thoroughly disapproved of their liaisons and she purchased a cottage beside Montsalvat for her two unwed granddaughters and children to live. Sonia Skipper published an autobiography of her interesting years titled My Story. VI. 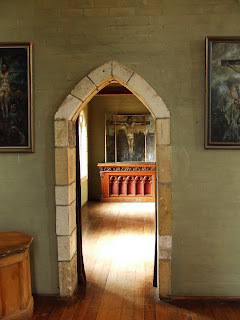 continued: the master, the artists, the muse and Montsalvat. 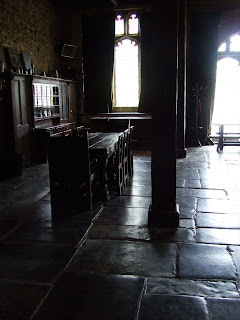 Great Hall dinners where celebs met round the refectory tables had Jorgensen pontificating over philosophy and matters of interest. A regular who's-who of artists and thinkers rolled up to exchange ideas and to socialise. For one, as a child, the eminent classical guitarist, John Williams, strummed away for the assembled groups and spent time there as a friend of the younger generation. 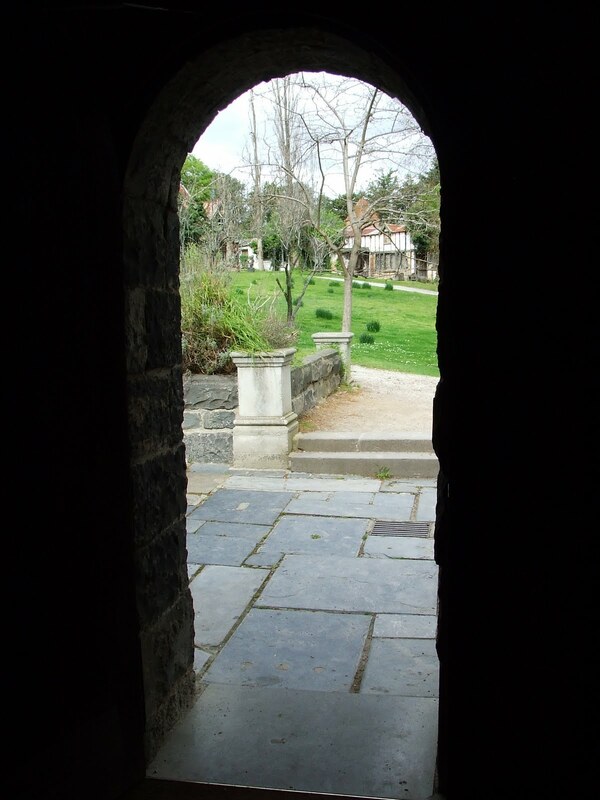 VI continued: 'Wotan', the 'Hall of the Gibichungs', 'Erda', Montsalvat and the Shire of Nillumbrik. 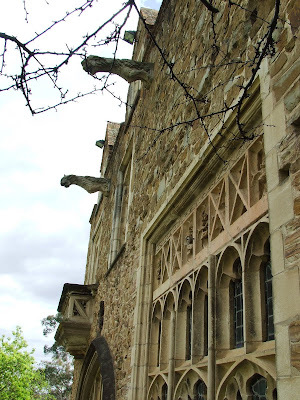 Jorgensen went all medieval, or was it gothic, with fanciful plans for the Great Hall and we can go on exploration of this resulting grand fantasy illuminated by mullioned Tudor windows. Major feats of recycling were ahead of their time and resulted in a wealth of features and a blend that works well. 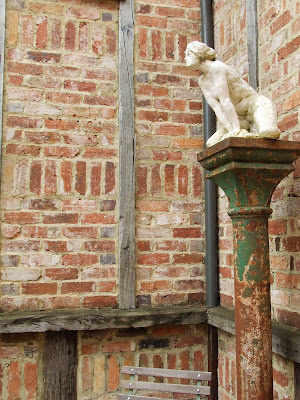 The stone windows, gargoyles and hugh fireplaces were thanks to Whelan the Wrecker (into demolitions) who became involved and salvaged grand old pieces from city buildings. On site, as well as painting, Jorgensen taught Sonia Skipper how to build and she eventually trained other workmen. As an artisan she carved stone and wood and used a range of building techniques as a pioneer of the colony. 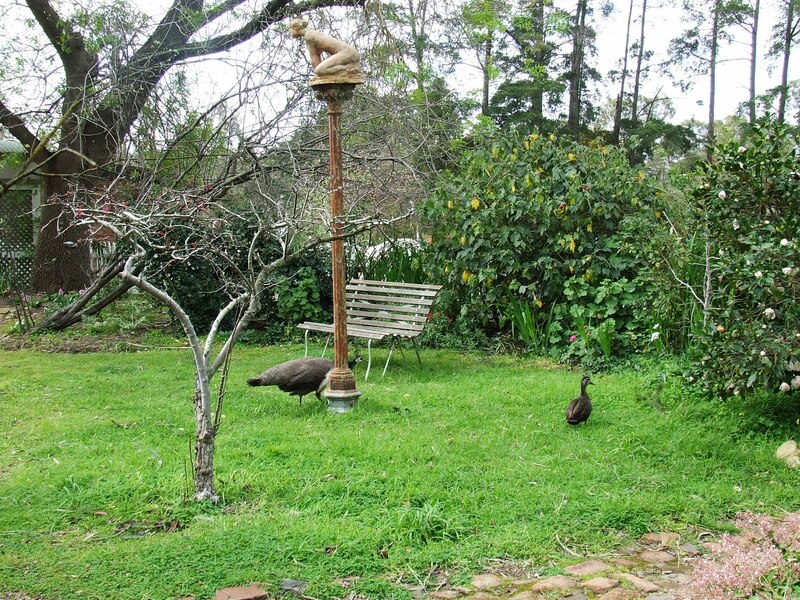 V. continued: the master, the artists, the muse and Montsalvat. The Skipper family were arty folk who moved to the artist colony in 1934 and it was their eldest, Helen, who became Jorgensen's mistress. Second daughter Sonia also developed her art and talents after early influences from the tonal school and the annual artists camp at San-Remo and the tutoring at Montsalvat. Sonia found a lover in Arthur Munday and she and her sister both had their first born within hours of each other. It is said that Jorgensen's wife, Lily, turned from work in medicine to that of psychology and that she suffered from MS. Medical treatment or any weaknesses were frowned upon by the 'master' and she remained uncared for in her later years until friends intervened and she moved away to the city. Whether this last information is reliable is hard to say. 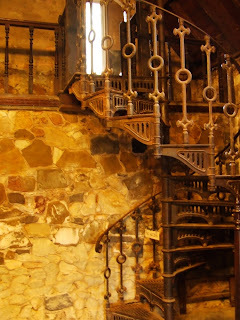 It is contained in a site with extensive good photos of Montsalvat here. IV. continued. 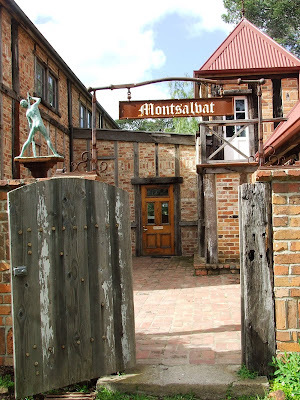 the master, the artists, the muse and Montsalvat. About the time of the birth of his and Lily's son Max, Jorgensen had begun an affair with one of his followers Helen Skipper. This relationship lasted for the rest of his life, produced two sons, and occasioned some notoriety in surburbia and the press. Helen and children lived in one cottage while Jorgensen continued to live down the hill with his wife Lily. Perhaps people invariably believe that anyone living a different kind of lifestyle must be up to no good. How wrong they were! We were a most moral and responsible lot, almost puritancial in fact. From The Age quoting from My Story by S Skipper. III. 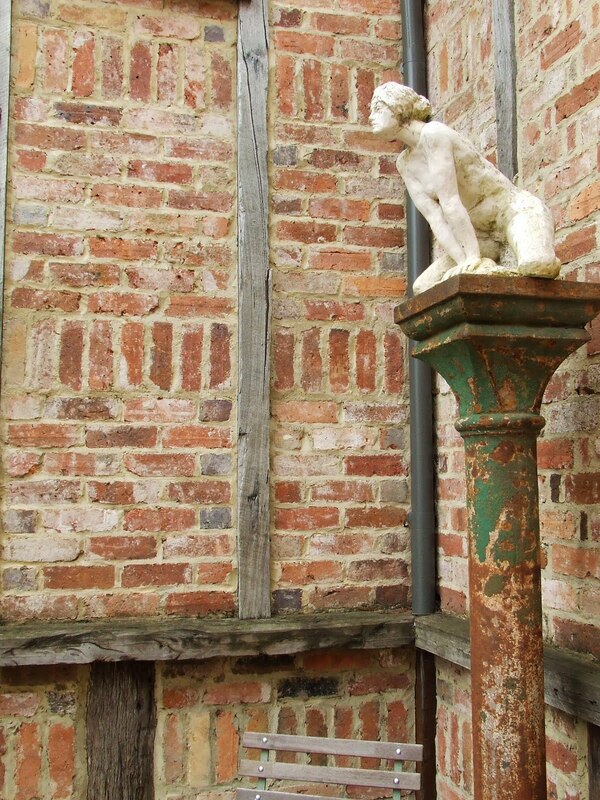 continued: impresario, artists, muses and Montsalvat. Justus Jorgensen married Lilya Smith in 1924 and they travelled to Europe to further his interests in art. Lily qualified and worked as a doctor and supported her husband. They returned to Melbourne and Jorgensen taught in his studios and became independent of the painter, Max Meldrum. He usually shunned exhibitions and hype. 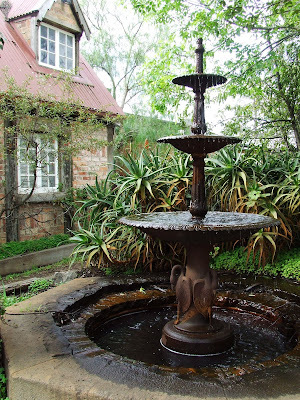 Lily bought land at Eltham (1935) and with the assistance of friends and students, husband Jorgensen began the artists' colony of Montsalvat. 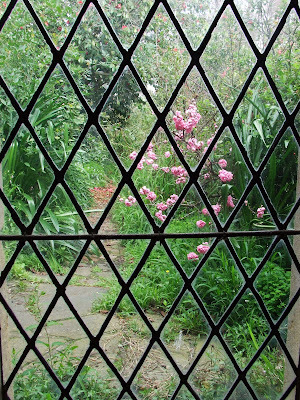 (The bush at Eltham was renowned for providing endless painting possibilities; restrained colour and subtle tonal modulations were features in stark contrast to our overexposed landscape. II. 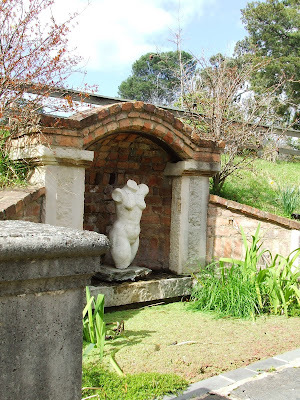 Continued: Impresario, artists, muses and Montsalvat. 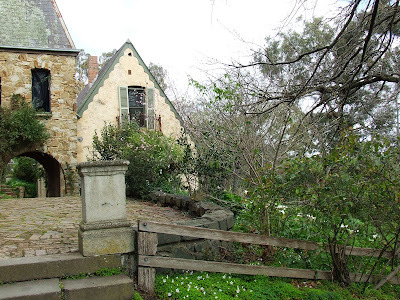 Justus Jorgenson founded the artists' colony of Montsalvat in Victoria. He was born in 1893 in East Brighton, Melbourne and his cultural heritage was Norwegian. Justus became articled to his uncle, an architect, and qualified as a draughtsman. After working briefly in a government office, he learned painting at the National Gallery School in 1915-17. He later joined artist, Max Meldrum and soon became his assistant. From Australian Dictionary of Biography. 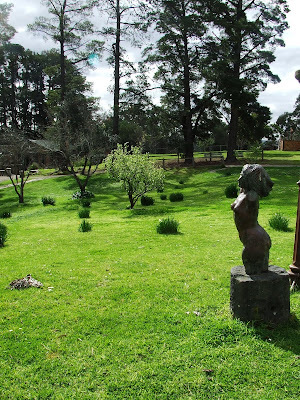 A wedding setting for incurable romantiks or a park in which to wander and picnic or see the galleries or as a corporate venue or for a dining experience, all this and more is Montsalvat. A short drive from Melbourne, in Eltham, is an acerage with the artists' colony of Montsalvat where a cluster of dwellings lie on a grassy slope where a Gothic fantasy, in stone, rests alongside little French provincial cottages in contrast to a string of naive farmhouses. Justus Jorgensen was the founder, who, with a group of associates, began building this labour of love in 1935 and he recreated a quaint neo-European enclave. Cutting edge architecture was not for him and he 'grew' this anachronistic settlement which nowdays has become a heritage property for us to enjoy and support. Yesterday, the dog and this beetle, just like the one on my necklace, were diversions during the awful trucking 'show' in the park. 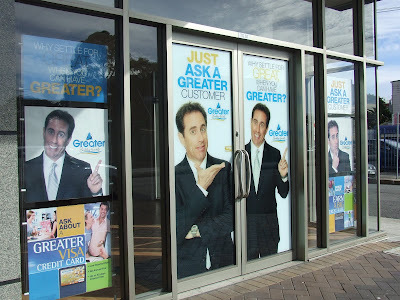 There is this personality and an ad campaign for the Greater Building Society, or bank, seen here on their doors and in the media. Full marks for trying. Investments. Sure, Jerry is cagey with money and most things, yet, on the negative side, he is near the centre of economic melt down and the footage was no way like a local shopping centre as I think was intended. A prize to see him in 'Vegas is offered. Has this swayed the investor/borrower? It is good to remember him in the series with the devious plots that were simply constructed out of nothing. 'Out of nothing' - sounds like the tactics of the investment bankers.